On the Genshtab (Генштаб) Soviet military maps, I can read that this ford through the stream Вертный has a stony bottom, a depth of at most 4 dm, and a width of 29 m (under typical circumstances)¹. That is indeed fordable. It also indicates that the flow velocity is 0.6, but I can't find anywhere what unit the velocity is in. I've found an English language legend as well as a more detailed Russian language legend — screenshot below — but neither appears to describe the units. I would expect it to be km/h, but it might be m/s, which is a factor 3.6 different. What unit is it in? I'm starting to learn Russian but I don't understand enough yet to find this information. I'm sure the quantity is speed and not total flow, because this small mountain stream (15 metre wide, 0.5 metre deep) has 2.5 speed units, whereas this river downstream (1310 metre wide, 10 metre deep) has 0.4 speed units. 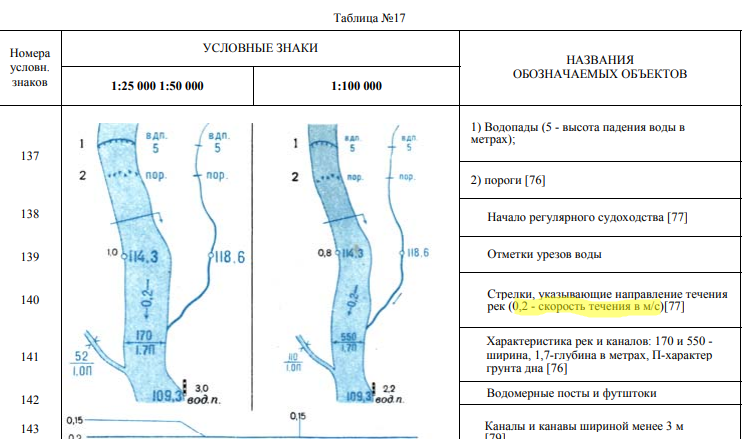 The text means "Arrows that show rivers' flow direction (0.2 is a speed of the flow in m/s)"
Not the answer you're looking for? Browse other questions tagged maps russia or ask your own question.